Just when we think we’ve seen everything, there comes a iOS accessory that helps us keep our cool. Read on for that and the rest of the new accessories that caught our eye this week. Cubedge: Audiophiles might want to check out the $149 Edge.sound wireless speaker system. It’s a portable device that offers 10 hours of battery life—more, if you separately buy a compatible solar panel—and Bluetooth connectivity so you can play tunes wirelessly from your iPhone or iPad. The Edge.sound weighs less than a pound, and it includes a microphone to let you use the unit as a speakerphone in conjunction with your iOS device. The system ships in September. Edifier: If you’re looking for sleek design in your audio products, check out the $130 Prisma E3350. 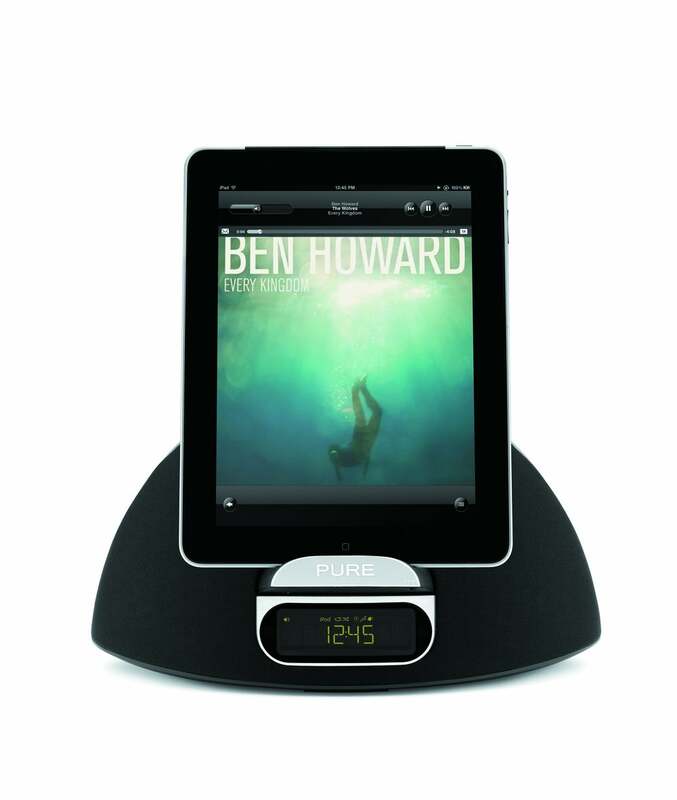 It’s a Bluetooth-enabled speaker system that can wirelessly play music from your iPhone or iPad at distances of up to 30 feet. 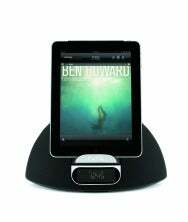 It offers 48 watts of power, and it sports a separate bass control for the subwoofer. The Prisma E3350 also includes a wired controller, that sits on your desktop, with a headphone jack and auxiliary-input ports. 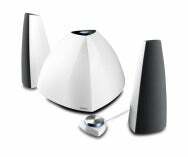 The system comes in one of three colors: Black, white, or silver. 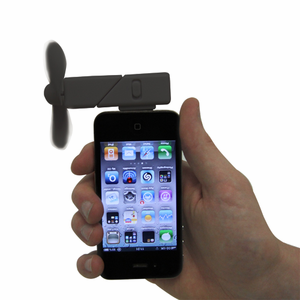 Gadgets and Gear: We’re big fans of the iPhone, so what’s a better accessory than…a big fan for the iPhone? Our friends at LikeCool.com first noticed the $17 iPhone fan. Just plug it into your phone’s dock-connector port and feel the cool breeze. There’s no app required to use the device, which essentially uses your phone as a battery—according to the company, that power consumption is “minimal.” You might, however, want to remember to remove it from the phone before taking a call: The fan blades are unshielded and might not feel great whipping against your chin. Griffin Technology: One of our favorite things to use our iOS devices for is to make music. Griffin’s $80 MIDIConnect MIDI interface can help you do just that, letting you plug keyboards and other electronic devices into your iPhone or iPad to make sweet, sweet music. The interface plugs in to your iOS device’s dock-connector port using a 9-inch cable, making it possible to import instrumental audio into Garageband for recording and mixing. iMpulse Controller: We acknowledge a little problem with our gaming on the iPhone: Sometimes our big, beefy thumbs obscure enough of the screen to make gameplay more difficult that it would be with a dedicated controller. 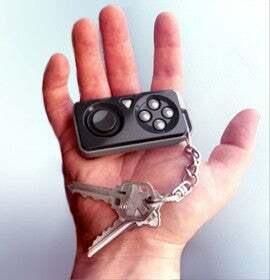 The $20 iMpulse Controller solves that problem by taking your fingers off the screen and placing them on a Bluetooth-enabled keychain fob with gaming buttons and a thumbstick. The controller requires its own battery, but it’s compatible with hundreds of iOS games. It’s scheduled to ship in the fourth quarter of 2012. Pure: Just last month, we told you about the Contour 200i Air, an Airplay-enabled docking speaker system for the iPhone and iPad. Now Pure is back with the 200i’s little sibling, the $170 Contour 100i. As the lack of “Air” in the name suggests, Airplay compatibility is excluded, but you do get an integrated FM radio, sleep timers, a remote control, and a headphone jack. There are also some nice design touches—for example, the dock cradle tucks out of sight when not in use. 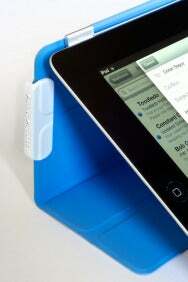 Smarter Stand: Love Apple's SmartCover for iPad but wish it offered a wider range of viewing angles? The $9 Smarter Stand solves the problem with just a little bit of smarts: The device is a plastic clip that attaches to the SmartCover to keep the folds from (natch) folding. Instead of holding your iPad almost completely upright or almost completely flat, you can now use your Smart Cover to view your iPad at 33-degree and 45-degree angles. Although the Smarter Stand is currently on Kickstarter, the product met its fundraising goal in under 24 hours and the company is already taking pre-orders; shipping starts in the fall. Touchfire: Here’s an iPad keyboard that’s different from most of the Bluetooth-enabled accessories we usually tell you about. The $50 Touchfire keyboard is a transparent, silicone layer that fits over the screen of your iPad and allows you to “touch type” directly on the screen. The flexible material folds out of the way if you want to see the entire screen for reading or viewing. The Touchfire is another Kickstarter success story: Organizers were attempting to raise $10,000 and ended up with $200,000 to finance production. The Touchfire is available now. USBFever: Say cheese! The $19 Remote Shutter Release for iPhone and iPad helps you do just that. This remote camera trigger plugs into your iOS device’s headphone jack and lets you snap photos using the included wired remote, making it easier to arrange photos or even get in front of the camera yourself. The almost-three-foot cable lets the device be used in conjunction with a tripod, and the trigger is compatible with the iPhone 4 and 4S, as well as the second- and third-generation iPad.